Home » News » Singapore Airliner (SIA) AirBus380 turns back after engine failure. Singapore Airliner (SIA) AirBus380 turns back after engine failure. 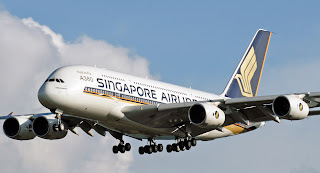 Singapore Airliner (Singapore International Airline) A380 was forced to turn back to Paris 2 hours and 45 minutes after took off from Paris and headed for Singapore with 444 passengers onboard due to its fourth engine failure. The huge double-decker AirBus 380 can continue its journey as its designed which was created by AirBus, but turned back to Paris as a precaution. The engines on that giant aircraft was built by British Rolls Royce Group . No Comment to " Singapore Airliner (SIA) AirBus380 turns back after engine failure. "